You know when you really want cake but you also don’t have time (or possibly the energy) to whip one up? For me, that’s about every time I want cake. And since there aren’t a ton of mouths to feed in our house, baking a cake without a party just isn’t practical. That’s where the beauty of the mug cake comes in. We are talking cake in about 5 minutes. And one, maybe two dishes to clean. Sold? Yep. So am I. Get ready for the next few posts being all about cake and celebration. I wanted to bring some fun celebratory recipes to go right along with our theme this month. Only a few days until Sam’s adoption finalization, his Baptism last week, our anniversary–April is officially our new best month. So let there be cake. The thing about mug cake, is it is literally a matter of whisk, microwave and eat. So when you have a craving, you don’t need to run to the store, and you surely don’t need to pull out all the baking supplies. Just a few simple ingredients and you are set. 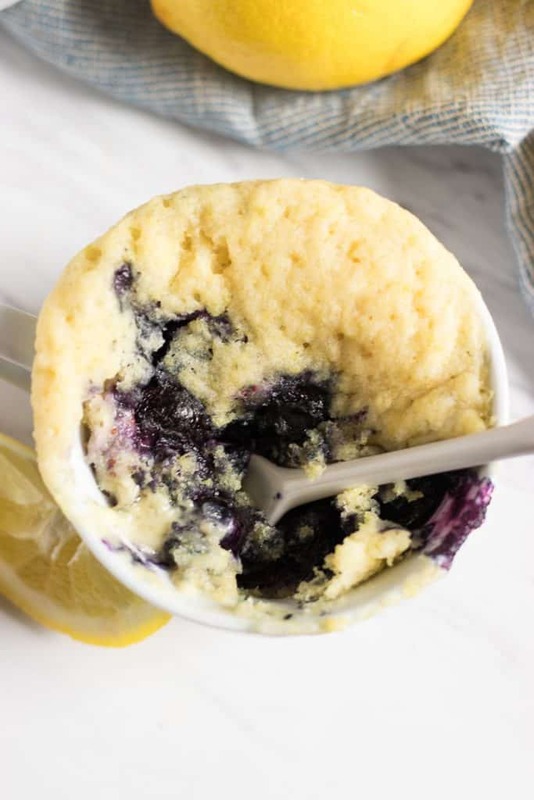 I feel like this recipe is actually a touch more like a Blueberry Lemon Mug Muffin since I am not sure entirely that this flavor falls in the popular cake flavor category, but Mug Cake just sounds better to me than Mug Muffin. 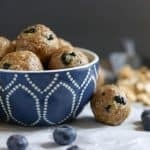 If you were craving just a blueberry muffin, you could actually skip the lemon and it whips up a fluffy, moist blueberry muffin in minutes. So we will call this recipe a two for one! I have a few other mug cakes on the blog including a Dark Chocolate Cherry Mug Cake as well as a Flourless Dark Chocolate Almond Mug Cake and while these are still great treats, the mindset I had when creating these recipes was, “How can I make a cake and avoid using sugar, flour and butter?” because those were “bad” foods to me at the time. But this Blueberry Lemon version is the opposite. It’s cake, in the traditional manner, with the rich buttery flavor and all the good stuff that I love. And it is perfectly satisfying–so when you want your cake AND to eat it too, this is it! I understand not everyone can have certain ingredients, so modifications can certainly be made as needed. You could try a vegan butter if needing dairy free, or coconut oil may work but I haven’t tried it yet. I love turbinado sugar (raw sugar) in mine. And for gluten free, an all purpose gluten free flour should sub perfectly. The other things to note is that microwaves are not all equal. The time to heat may vary microwave to microwave, so you may have to play a bit of trial and error in the beginning. Next time you find yourself craving a big slice of cake, whip this baby up–cake for one, the kind you don’t even need to share! 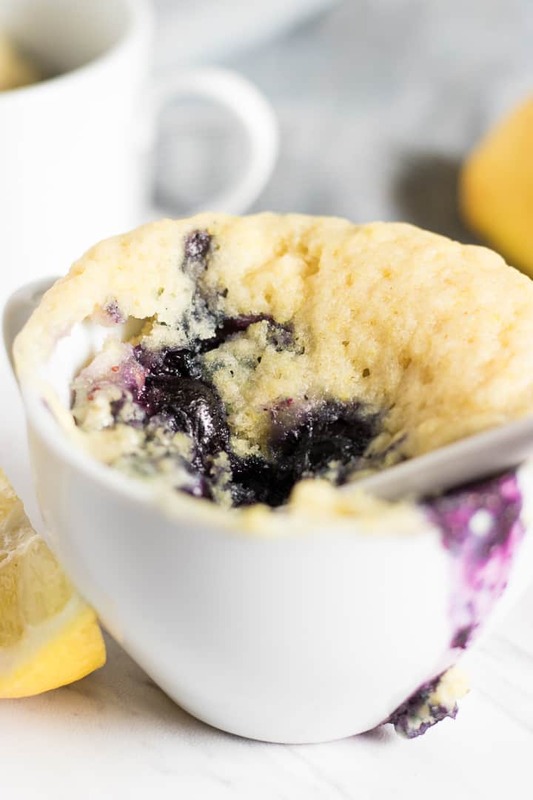 Blueberry Lemon Mug Cake for the WIN! Whisk together sugar, butter until smooth. Add in vanilla, milk, and yogurt and whisk. Add in sea salt, zest, baking powder and flour and whisk to combine. Microwave on high for about 2 minutes and 30 seconds (more or less depending on your microwave.) in a microwave safe mug or dish. Allow to cool for 5 minutes and dig in! If you prefer to bake this in the oven. Bake at 350°F for about 10-15 minutes. Making this recipe this weekend, yum! Then you will have an amazing weekend!!! Well this looks delightful, I love blueberry and lemon together. Thanks for sharing. For some reason it has been all about the mug cake here recently. I don’t know if it’s because spring is coming and we’d rather spend our time outside than inside baking and making?? But this is perfect timing for me and the child. Hope this one makes it to your list as well! This looks absolutely delicious! Light and sweet and satisfying. I love the single serving aspect of this! I’ve never made a muffin in a cup so this needs to happen! Oh yes, it’s a good one! This looks so delicious, simple, and best of all it’s Lemon!!! Yum! My fave for sure! Thanks Jennifer! This looks delicious, I love trying mug cakes! Pinning to refer back to later! Thanks for sharing! Thanks and hope you love it! Love this! I have such a sweet tooth, but if I had a whole cake in front of me, I’d eat it! I love this recipe for just a little treat! Can’t wait to give it a go! This looks so delicious! What a perfect way to satisfy a cake craving without making an entire cake! This looks incredible! I love blueberry and lemon together- I’ve got to try these. It’s a great combo. Enjoy! Okay this seriously looks amazing! Every mug cake I have ever tried has been a fail, but I will have to make another attempt for this one! Hope this is a no fail! 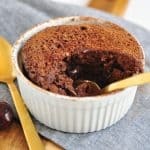 This mug cake looks so delicious and tempting!! It’s a good one I promise! I was just talking with my husband today about how we prefer fruity desserts. This looks delicious, lemon is always a winner. Lemon is my dad’s fave so I always think of him when I make a lemon dessert. Enjoy! 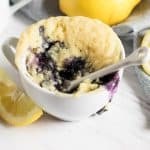 I just love the combination of lemons and blueberries and I can’t believe you made it so quick and easy! It’s such a perfect combo! I love mug recipes and this looks amazing! Blueberries and lemon are such a great combo! Aren’t they the best? So simple! This one is perfect for a busy person like me. So easy to prepare and looks delicious. I will try this recipe tomorrow morning. Thanks for this recipe!. Yes! When time is limited, this is a goodie. It’s a keeper I promise! Congratulations with everything this month! So happy for you. And I agree, I also struggle with not enough mouths to feed when I want cake, so this is an absolute winner! Thank you so very much Stine! Blueberry and lemon is my most favorite combination. That mug cake though….looks gorgeous! I can’t get enough either. Enjoy! Urghh I wish I had seen this last night when I was desperately craving dessert but I didn’t want to make anything time-consuming! Maybe I’ll have to make it tonight now 🙂 I even have blueberries and lemons in the fridge! Ughhh. Well there’s always tonight?! Does this recipe require vanilla? You mention it in the process but not the ingredient list. If so, how much? Thanks for catching that! I added 1/2 tsp. I will update the recipe. Thanks!